Cultural heritage and violence in the Middle East. The violence in Iraq has killed nearly 6,000 civilians since the start of 2014, according to the UN Assistance Mission for Iraq. In Syria, over 100,000 lives have been claimed and some two million persons displaced since the start of the civil war in March 2011. Media coverage has rightly focused on the human dimension of suffering. With this essay, however, we want to reflect upon another important aspect of the violence: the systematic destruction of cultural sites and objects. According to reports of the activist Facebook group Le patrimoine archéologique syrien en danger, all six UNESCO World Heritage sites in Syria have been damaged, major museum collections at Homs and Hama have been looted, and dozens of ancient tells have been obliterated by shelling. In Iraq, recent media stories recount ISIS fighters’ use of antiquities to raise revenues. So-called blood antiquities function as cash-cows, fetching high prices from unscrupulous collectors and netting a handsome cut for ISIS. As devastating as this news is, Syria and Iraq are simply additional chapters in the long-running story wherein conflict is characterised by a two-fold assault on humanity: human bodies themselves as well as the objects and sites that people create and infuse with cultural meaning. Cultural violence is not a practice exclusive to Islamic groups or areas; rather, it is the nature of all radical ideologies, religious and national alike. They proceed with a predictable agenda: first to paint the world in black and white, and then to erase all shades of cultural practice from non-white to black. 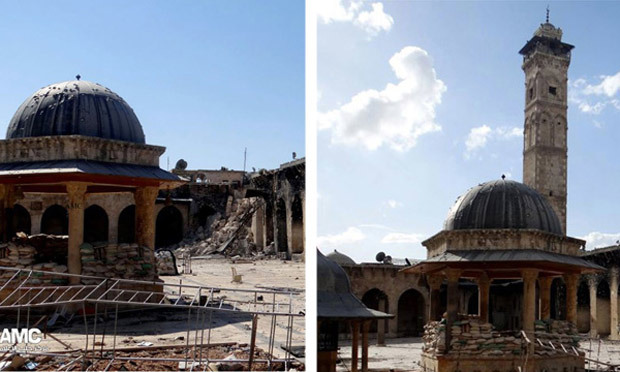 Historic minaret of the Great Umayyad Mosque destroyed in Aleppo.